Scream it from the rooftops, scream it from the balconies, "Love is dead, love is over, there is no hope for it at all." Grab your neighbour, hold them tight, look into their face and holler, "Love is gone, the dream has ended, it was never meant to last." Sing its dirges, pen its elegies, love has departed and left us all the poorer. "Why the incredibly plaintive intro that seems quite tonally jarring for a website that, on the surface at least, seems to consider its bread and butter, light and frothy entertainment content?" I hear you ask. Well, dear reader, it brings me great sadness - though a large portion of that sadness may simply be attributable to the fact that it is still relatively early on a Monday and I haven't quite fully come to terms with that yet - to inform you that Adam and Zara, of Love Island fame, have announced the demise of their relationship. Yes, another week, another financially lucrative relationship, forged in the crucible of reality television's apogee, Love Island, has been cast to the scrap-heap. Two weeks ago Megan and Wes announced that their relationship had breathed its last; a little less than a week later, Josh and Kaz announced that their relationship, having grown grey about the chops, had been sent to the glue factory, and now, Zara has announced that her and Adam have delivered the remnants of their love to a designated waste disposal facility, where it will be stripped of any reusable materials, andthe remains consigned to an open-air landfill. If anything, it is a surprise that their relationship lasted as long as it did. Few would've predicted when Adam and Zara left the show, that theirs would prove to be the second most enduring relationship. Given that Adam seemed to change partners as often as his socks, it was quite a surprise that she and a man who is essentially a personified Jager-bomb; the raucous 'Wahey' that erupts whenever someone drops a glass in a pub made flesh, a lingering and damp hand on the small of your back manifest as man, had made things work for so long. 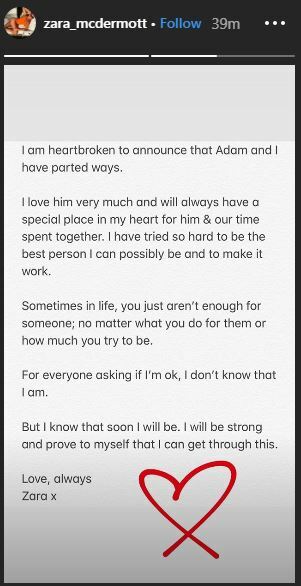 She announced their split in an Instagram story, saying that "Sometimes in life, you just aren't enough for someone; no matter what you do for them or how much you try to be." Making it seem as if there was some animosity in the break-up. Jack and Dani, it is up to you, and your quite possibly artificial and financially-motivated decision to maintain your relationship, to help keep the small and fluttering flame of love alive. If it is extinguished, we must all embrace the darkness - or wait until the next season of Love Island to go through this whole rigmarole again.